I’ve always had a special place in my heart (or is it my stomach?) for Asian foods, whether it be Korean BBQ, Thai curries, Japanese sashimi and Shabu-Shabu, Taiwanese pork intestines, or most anything from the Hunan or Szechuan provinces of China. Since moving to Bonaire over 12 years ago, I’ve also discovered foods and ingredients with an Indonesian background. That’s because Indonesia used to be a Dutch colony, and Indonesians have become an integral part of Dutch society, including the Dutch Antilles, which is where Bonaire fits into the Dutch Kingdom. Among my favorite Indonesian ingredients to cook with are Ketjap Manis and Sambal Oelek. Ketjap, also known as Kecap or Ketsap, refers to a sauce used for cooking or as a condiment. You may note the similarity to the English word Ketchup (or “Catsup”, as it was originally known). Indonesian Ketjap is soy-based, with Ketjap Asin (Asian Ketchup) being what we know as regular soy sauce, and Ketjap Manis being a sweet, thicker soy sauce. “Manis” means sweet in Indonesian. 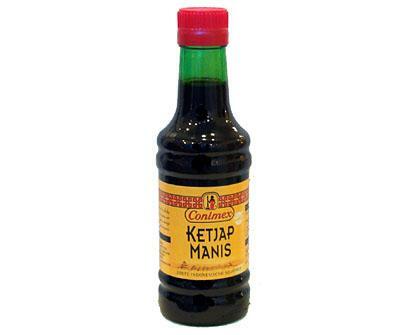 Thus, Ketjap Manis is a sweet soy sauce. You can simulate ketjap manis using regular soy sauce and cooking it with brown sugar and molasses as well, although I find authentic Ketjap Manis to still be better (and easier) to use than concocting something similar out of regular soy sauce. There’s a certain texture and flavor that Ketjap Manis imparts to foods that is tough to match. Sambal refers to a family of condiments which contain spicy chili peppers. Sambal Manis, for example, is a pepper relish which is sweet and spicy. I have also tried Sambal Badjak, Sambal Brandal, and Sambal Oelek. Some sambals are made with fish paste or vinegar or tomatoes. The one I tend to see in greatest quantity, however, is Sambal Oelek (also spelled Ulek), which is spicier and has a bit of extra saltiness (at least the brand I use). I’ve always been a fan of spice, and discovering sambals in all forms and flavors was a real treat. And that in turn brings me to today’s incredibly easy recipe (providing you have a source for ketjap manis and sambal oelek) – spicy green beans. Nip off the hard end bits of the green beans and put the resulting green beans aside (and throw out the hard end bits, of course). Heat the peanut oil (or use another nut oil like sunflower or canola) in a large sauce pan on medium high heat – the purpose of this oil it merely to lubricate the pan and beans a bit. Add the green beans and let sizzle for a minute or two. Add the water – this will help cook the beans a little more thoroughly via steam. The water should ultimately all boil off. Once the water is mostly gone, add the garlic and sambal oelek and stir them to thoroughly mix them with the green beans. Add the ketjap manis and stir some more. Cook until the ketjap manis starts to bubble and caramelize. At this point your green beans should still be cooked but not mushy. If you like mushy green beans, turn down the heat and cook longer (perhaps adding a bit more water). To make more spicy add more sambal oelek. To make less spicy, add less. Water For Tea – Purified, Spring, or Tap? Based on a WordPress Theme by Michael Tyson.